In our earlier posts, we discussed how to setup specific delivery dates in Order Delivery Date Pro for WooCommerce plugin. Specific delivery date means the schedule which is not on regular basis. For example, you have a seasonal business where you can deliver your products only on specific dates. But, you will charge an additional cost for the specific delivery dates apart from the order total. Additional cost for delivery means the expense which is made by the company while delivering their product to the customers by transport or courier services. So, in this post, we will discuss how you can setup delivery charges for specific delivery dates. This feature is available in the plugin where you can add additional charges for specific delivery dates. You can setup this under Order Delivery Date -> General Settings -> Specific Delivery Dates. If you have an online Umbrella shop where you charge extra $20 on the order if a customer wants the delivery on a specific date. For example, you deliver your Umbrella from 5 June 2017 to 10 June 2017. And you charge extra $20 for delivery on those days. Then you can set the 20 in the specific delivery dates charges option. 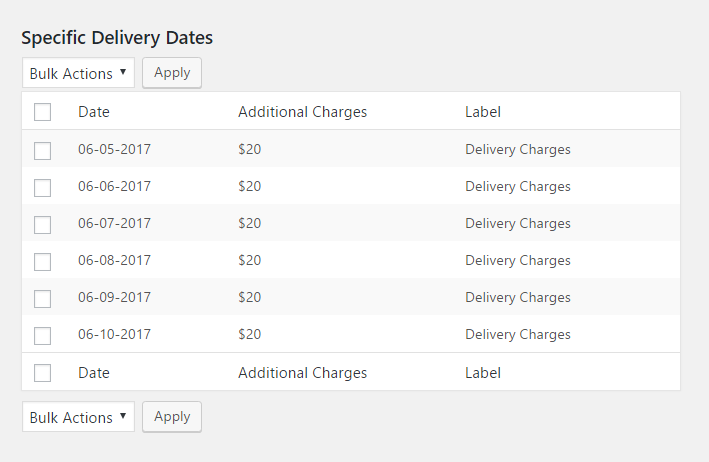 Along with delivery charges, you can set delivery charges label which describes the additional cost added to the order upon selecting the date. Once the above settings are done, you can see the delivery charges and delivery charges label which are added for specific delivery dates in the Specific Delivery Dates list table shown below. If a customer comes to place an order on 7 June 2017 so they will find $20 as an additional cost added in Your Order table upon selecting the specific delivery date on the checkout page. When both delivery weekdays and specific delivery dates are enabled together, delivery charges for the specific delivery dates will be added on the checkout page. In this post, we saw how you can charge additional cost for delivery on specific delivery dates. This is useful for the businesses where you do not have fixed days for deliveries and you provide deliveries only with an additional cost.